I am dedicating this post to my younger son who is on a overseas trip for school Immersion program for 4 days. This is the first time he is on his own. For a Mom her child is always a kid. I have a mixed bag of feelings and at the same time very happy as my son was selected for this program. Not many people get this opportunity. This will surely help him to learn and understand the world and become a good human being. He has an opportunity to explore and learn new things. He told me Mom please don’t get emotional when I am leaving for the trip as I will be back soon. I am deeply touched. All of us at home are missing him as he keeps everybody on their toes all the time. We are waiting for him to return this week. 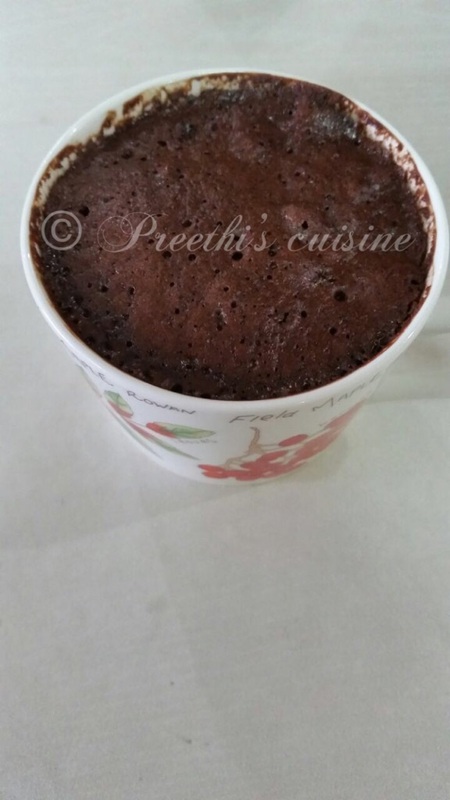 Before he left ,I made his favorite 2 Minute Mug cake(eggless) . This is a no fail recipe. I can bet this will satisfy your hunger cravings. 15 Pcs of White Chocolate. Mix all the dry ingredients in a bowl. Whisk milk and oil .Slowly fold in all the dry ingredients and mix well. Ensure there are no lumps. 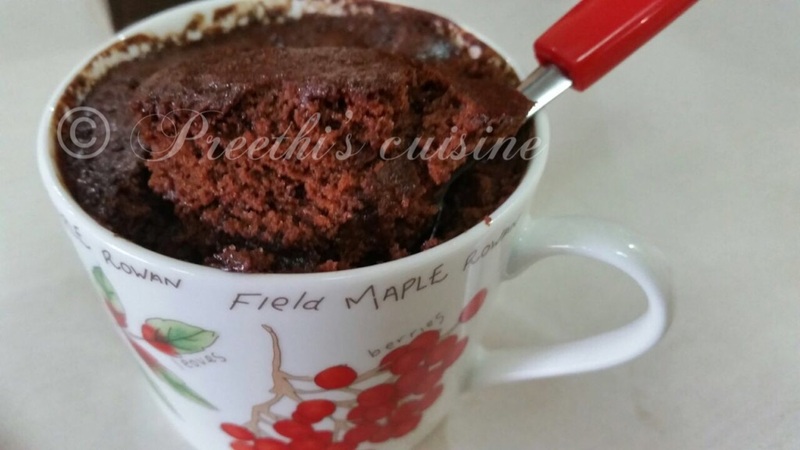 Pour 1 tbsp of batter into a microwave safe mug. Drop the white chocolate in the center. Pour some more batter on the top. Please leave sufficient head space for the cake to rise. Place the mugs on paper napkins in the microwave. Microwave on high for 2 minutes (My microwave is 800 Watts ). Serve with cold ice cream or you can eat it just like that. 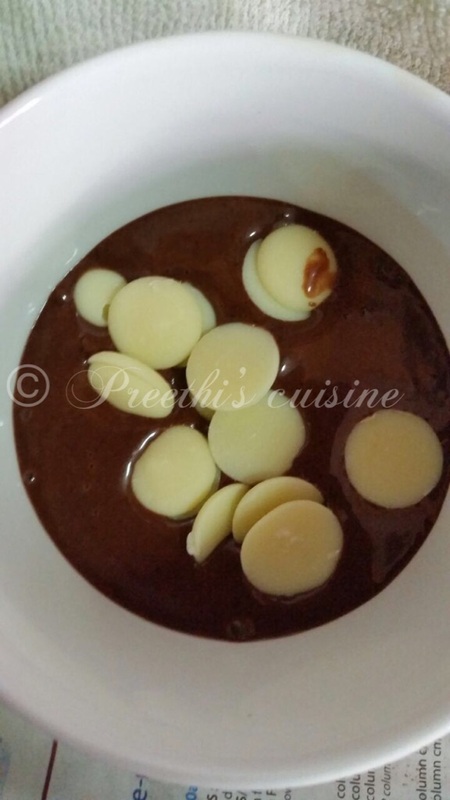 ← Hey I am happy to share that Chef Ajay Chopra 's chosen fan recipe is my onion stuff recipe and it is published on his website. Hi the recipe says 15pcs of white chocolate. Could you pls give its measurement in grams ? Cos choc chip sizes can vary. Thanks in advance !! Neha there is no specific measurement.I had 15 pcs of chocolate and each piece is the size of gems or M&M.If you are adding dairy milk then just 1 square will do.Hope this helps. 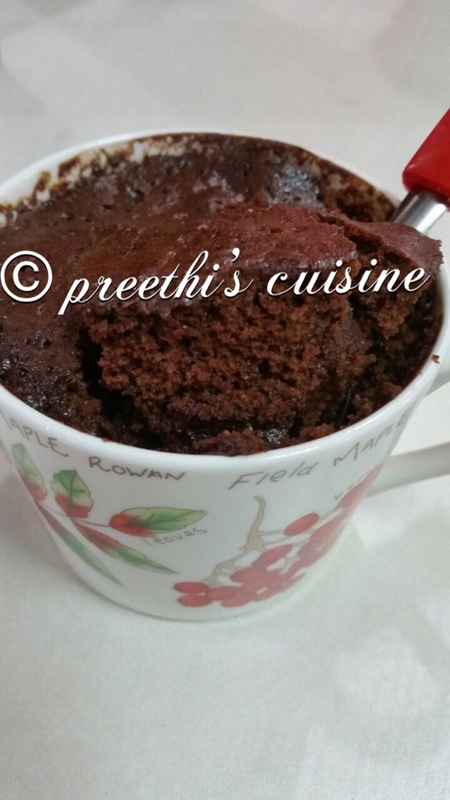 Hi Preethi, my 8 year old was craving for chocolate cake. Tried your recipe and he just loved it. Thanks and keep it up. Glad to hear that Shilpi.Thanks for your feedback.